What follows is an inventory that can also serve as a guided tour through the parts of the Friden Flexowriter system we have, originally manufactured in the mid 1960s. Click on any of the thumbnail photos for a larger view. The central component of the Flexowriter mechanism is an electric typewriter, with added hardware, the code selector, to encode keypresses into Friden's character encoding, and more hardware, the translator, to decode from that encoding to actuate keys. While the streamlined housing for the 2201 looks very modern, both the frame and housing are injection-moulded castings, probably zinc alloy such as Zamak. According to the manual, the shipping weight of the 2201 is 132 pounds (the 2301 is lighter, with fewer function keys and less logic). The Flexowriter is designed to balance on its rear end for easy access to its underside. When we tipped our machine onto its rear, we found that only two of the rubber feet were intact. One was missing and one was only half there. We therefore set to work to make replacements. The nameplate inside the front cover of our Flexowriter identifies it as model 2201, rated at 115 Volts, 2.3 Amps, 60 Cycles. The serial number is stamped into the top of the right rear frame just in front of the right hinge for the relay-mounting backplane. Our machine is serial number 209003. The date codes 67-11 and 68-30 are stamped on the two 75-pin data connectors on the bottom of the machine, so it must have been made after the 30th week (July) of 1968. -- 2700445 Type Action for Typewriters, Edwin Blodgett, 1955. -- 2797788 Carriage Return Mechanism for Typewriters, Edwin Blodgett, 1957. -- 2905298 Writing Machine, Edwin Blodgett, 1959. 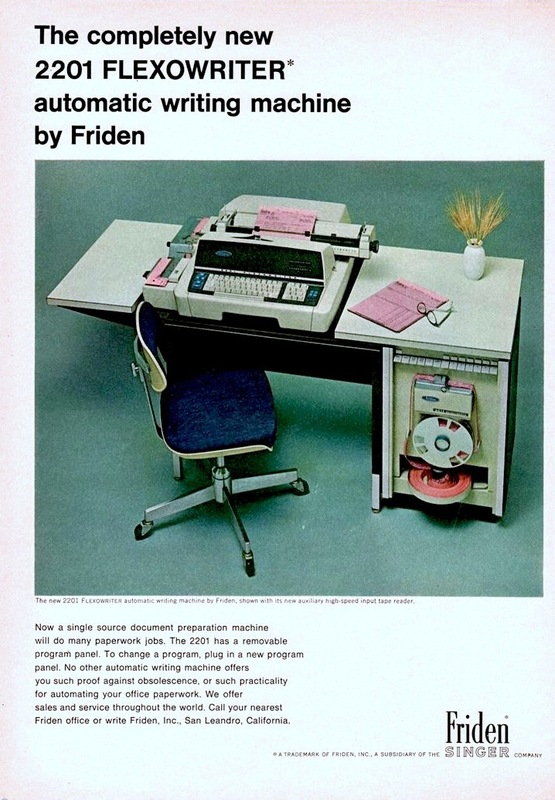 The Friden 2201 was priced at £2,900 in 1969, according to the British Commercial Computer Digest. The dimensions given there, 5 by 3 feet, must include the table we do not have. The Computer History Museum has a Model 2301, a Model 2301-A and a Model 2303 Flexowriter. At first glance, these look identical to the machine described here, but the machine we have has an array of programmable function keys between the keyboard and the power switches on the right, where none of the museum's machines have this feature. The inventory of the University of Amsterdam Computer Museum lists a Friden 2201; a photo is attached to the inventory entry. Judging by the photo, it appears to be in good condition. The Flexowriter keyboard differs from the standard QWERTY keyboard in several important ways. The first and most obvious difference is the cluster of special function keys marked F1 to F13 on the righthand side of the keyboard. As with the function keys on modern computers, these do not have a fixed interpretation, but rather, their interpretation is programmable, although the F1 and F3 keys have legends on the keycap indicating the "usual" interpretation. A second set of function keys on the left side of the keyboard have fixed functions related to the paper-tape punch and reader. The keys labeled START READ and STOP READ start and stop the reader, while the TAPE FEED key causes the paper-tape punch to punch leader (a series of ignored character codes). NON PRINT is used to turn off printing, so that, for example, binary tape can be duplicated. TAPE SKIP causes content on the tape reader to be skipped until a control character is encountered that causes normal function to resume. Finally, the numeric row of the keyboard has the numerals in the shifted position and the punctuation marks in the un-shifted position, the reverse of most typewriters as well as the reverse of most computer terminals. Note that the punctuation marks aren't exactly the ones yu would expect on a modern computer keyboard, although many of them are on the keys where you would expect them. The print mechanism is an entirely conventional type basket, fixed to the main chassis, working against a paper carriage that moves left and write as the typing progresses. Many typewriters, even manual typewriters, had a tab key. Pressing tab would advance the carriage to the next tab stop. The tab function of modern word processors is derived from this. On a modern word processor, tabs are set by dragging and dropping tabs around the "tab bar" sub-window. On many typewriters, the tab bar was a physical bar, a rack, on which clips could be set to indicate tab stops; that is how the Flexowriter tabs were set. An interesting feature of the Flexoweriter is that the tab rack itself can be pulled from the machine, so different tab racks could be quickly swapped in and out instead of forcing the typist to fiddle with the tab stops each time a different form was used. One of the clips has been pulled from the Flexowriter tab rack in the photo and is shown above the rack. The Flexowriter power train begins with a 0.035hp 1725rpm motor in the lower rear of the machine. This drives the entire mechanism, including paper-tape reader and punch, through a total of 6 separate drive belts. and shafts. The main belt from the motor, a toothed timing belt, drives a jackshaft under the typewriter carriage. Additional belts take power from this jackshaft to the power roller, paper-tape punch and carriage-return mechanism. An additional belt takes power from the left end of the power roller to the paper tape reader, while a belt from the right end of the power roller delivers power to the translator (decoder) under the keyboard. One of the driven elements, under the keyboard, is the drive roller. This rubber roller crosses the width of the keyboard. When you press a key, this engages a cam against the drive roller. The rotating roller grabs the cam, giving a solid yank to the key and powering not only the typing mechanism but also the keyboard encoding matrix. -- 3355000 Type bar actuating mechanism with separate drive and actuating bell cranks, Edwin O. Blodgett, 1967. When you press a key on the keyboard, the code selector encodes that character in the binary code used by the Flexowriter. Pressing the key engages a cam on the power roller. One of the things this cam does is pull or push that key's code selector slide. A set of bails is mounted across the slides, one bail per bit in the encoder output. Raising a bail closes the switch to set the correspoinding bit. Each intersection of a slide with a bail is a location where a link can be installed. The links, yellowish plastic parts visible in the photos here, are arranged so that pulling or pushing the selector slide associated with one key will raise the subset of the bails corresponding to one bits in the code for that key. The entire code selector or encoder matrix is mounted on hinges. With the Flexowriter tipped up onto its back side, loosening two jack screws allows the entire encoder, including its black plexiglass bottom cover, to swing out and down exposing the power roller and the underside of the typing mechanism. The jack screws have conical bases in order to precisely align the code selector slides with the keyboard when the matrix is in its operating position. -- 3269509 Easily removable and adjustable code selector linkage means, Henry E. Smith, 1966. Power to the paper-tape punch is delivered by a belt from the jackshaft driven by the motor. The paper-tape reader is powered by a short belt driven by a pulley on the left end of the drife roller shaft. This drives the reader through an electrically triggered single-revolution clutch turning a cam-shaft that drives the reader. Each revolution of the cam shaft drives one read cycle, advancing the paper tape, and then lifting and lowering the sense pins to sense holes in the tape. The bottom end of each sense pin operates a multipole switch that serves both to encode the binary data in electrical form and to partially decode the data. Unlike most paper-tape readers, this one has two drive sprockets, one ahead of the read mechanism, one behind it, linked by a large spur gear on the side of the reader. This allows this reader to reliably feed edge-punched cards, a data recording medium unique to the Flexowriter. Without the second sprocket, the cards could easily be pulled out of alignment during reading. -- 2945623 Tape and Card Record Media Reader, Edwin Blodgett, 1960. The rear cover of the Flexowriter is made of die-cast metal. A screw on the bottom of the cover closes a microswitch in the power circuit, so the cover must be closed in order to operate the machine. Opening the cover exposes a secondary inner cover over the relays at the back of the machine, as well as a pair of circuit breakers and an assembly of microswitches on the rear of the carriage that sense the tab stops. -- 3202878 Plugboard Apparatus with Lateral Movement Conneccting Means, Mel Kinney and Donald Rolph, 1961. The relay cover is held on by two screws. Removing it exposes an array of 21 large multipole relays, hand numbered 2-7 and 10-24. The frame on which the relays are mounted includes several extra mounting positions. Some of these relays can switch as many as 10 circuits, with combinations of single and double-throw contacts. For reliability each relay contact is bifrucated – that is, split into a pair of mechanically independent (but electrically connected) contacts. These relays, together with the plugboard, are the source of the trade-mark Programmatic that Friden applied to these mahchines. On recept of specific control codes, the machine could switch between reading from its main paper-tape reader, a an optional secondary reader, and the keyboard. The plugboard socket has 320 contacts (16 rows by 20 columns), and the program on the back of the plugboard takes the form of a dismaying tangle of wires. The back of the plugboard has alphabetic row labels and numerical column labels printed on it to aid the programmer, along with lines dividing the different fields of contacts, but there is no explanation of the fields. The mounting plate for the relays and plugboard is held down by three screws. With these removed, the entire mounting plate swings up and back, exposing the massive bundles of backplane wiring that interconnects the relays and plugboard with the rest of the machine. The relay connections are all soldered, but the plugboard connections use crimped-on tapered pins that mate with the back of the plugboard socket. Each socket position can accomodate two tapered-pin connections and in several cases, both are used. The Selectadata auxiliary paper-tape reader is packaged in a wheeled cabinet that can roll under a cantelevered desk top. There is a row of switches at the top of the cabinet face, over the paper-tape reader. Below that is a motorized take-up reel and below that, a tray to hold the tape being fed into the reader. The actual reader mechanism appears identical to that on the older machine. With the cover removed, the specification and serial number tag for the machine is exposed. This identifies our machine as serial number 88-4273, model 23 14-3, 115 volts, 1.51.8 amps, 60 cycles, made by Friden Inc in Rochester 2, NY. The biggest puzzle on this tag is the advertised current draw of 1.51.8 Amps; our best speculation is that there was no room for a space, and that this really should be read as 1.5 1.8. Judging by the more complete data on the motor nameplate (see next section), these two current ratings apply at 60Hz and 50Hz respectively. The space in the middle of the model number poses a second puzzle; it appears to be another accident. A lower bound on the date of manufacture of the machine can be inferred from the quality control date codes on the parts. In this machine, the only date codes we have found are on the plastic plug bodies shown in the photo. These are coded 69-31, 69-51 and 70-01, indicating manufacture between week 31 of 1969 and week 1 of 1970. This suggests that the machine was built in 1970. Note that the Computer History Museum has a Model 2214 Selectadata. The photo they posted and the physical description of their machine suggest that it is identical to this one. The paper-tape reader is powered by a belt drive from a rather hefty motor behind the reader. The drive pulley, visible in the left rear view, drives an electrically actuated single-revolution wrap-spring clutch, visible on the left of the rear view of the reader. This allows the reader to advance one character for each pulse to the clutch release solenoid. The clutch drives a camshaft on the front right side of the reader. The cams on this shaft work the pawls that advance the tape feed sprocket, and they work the levers that raise and lower the pins that sense the characters encoded on the 8 data tracks of the paper tape. The bottom end of each sense pin controls a bank of switches. The motor nameplate shows that it was made by Robbins & Myers of Springfield Ohio and that it is rated at 0.35 Horsepower, drawing 1.2 Amps at 115 Volts, 60 cycles and operating at 1725 R.P.M, with a continuous temperature rating of 45°C. Powered at 50 cycles, it draws 1.5 Amps and runs a bit slower and a bit hotter. While the mounting cabinet differs considerably, the drawings in this U.S. patent seem to agree with the operation of our reader. Figures 4 through 7 document the wrap-spring clutch, while Figures 14 through 17 show how the reader operates. -- 2927158 Code-Form Converter, Edwin Blodgett, 1960. The supply reel for the paper-tape reader is a horizontal tray that swings out from a cubby inside the cabinet. A detent on the swing-out pivot holds it out of the way and roughly centered in the cubby when it is retracted. A second detent holds the tray in the open poisition for tape loading, and a third detent holds it in the operating position. The supply tray itself spins very freely, particularly after we lightly oiled its pivot. The center knob is conical, and in the photo in the section on The Table, you can see that the tape feeds from the center of the spool, guided up out of the center on the conical side of the knob and then curving up over the edge of the cubby to continue up the face of the machine to the tape reader. The paint on the left side of the top edge of the cubby of our machne is worn exactly where the tape in the photo of the table would rub. We are missing the take-up reel, but the take up reel hub is clearly visible in the face view above. The hub is driven through a simple slip clutch by a small squirrel-cage motor behind the front. Once oiled, it provided uniform light tension on the hub when turned on. The hub has 3 snap connectors that evidently connected to a removable take-up reel, to judge by the photo in the section on The Table. The face of this reel could be removed from the back in order to remove the tape from the take up reel for storage or to place it in the feed tray for re-reading. Note that the Computer History Museum has a pair of take-up reel covers. They have posted photos that make it clear that these are among the parts we are missing. The take-up-reel hub and motor are mounted on a door that latches flush with the cabinet front using a magnetic catch. This door opens inward to swing the hub back just far enough that it clears the plane of the cabinet front. Two holes in the cabinet front in line with the top of the door suggest that some optional feature could be attached there, perhaps a shelf or bin for feeding fanfold tape? Behind the motor driving the paper-tape reader, there is a vertical panel holding 13 large multi-pole relays, numbered 2-14. After removing 4 screws, this frame swings out and down to expose the backplane wiring on the relays. Half of the wiring to these relays appears to be bundled directly into the wires in the cable to the large connector, suggesting that this bank of relays serves largely as additional logic that can be used by the Flexowriter and not an inherent part of the function of the paper-tape reader. To the left of the relays (from the rear view) is a bank of 20 small selenium rectifiers. While it is difficult to trace the wires, it appears likely that these are flyback diodes connected across the different relay and actuator coils in the machine in order to suppress sparking on the relay and switch contacts powering those coils. The cable that connects the auxiliary paper-tape reader to the Flexowriter ends in a massive plug with an A-MP 201662-1 connector block. This can handle up to 75 pins, but only 62 positions are actually in use. Unfortunately, as we recieved it, one pin on the plug (the upper right pin in the photo) is broken and one jack-screw on the plug is missing its male insert (the left jack-screw in the photo). The jack-screws have double-lead threads, meaning we cannot duplicate them with commonly available taps and dies. Fortunately, the manufacturer and part number are clearly stamped on the connector. This led us on an interesting and eventually successful search for replacement parts. After repairing the plug. at the end of the cable from the 2314 auxiliary punch, we were able to plug the punch into the 2201 Flexowriter and begin testing. Finally, typing on the keyboard made the typing mechanism work, except that the carriage would not move side to side, nor the ribbon rise to meet the type bars. The same photo was used in this 1965 ad. We have found another picture of the table on page 481 of the book Banking Automation: Data Processing Systems and Associated Equipment, Volume 1, edited by G. W. A. Dummer, F. P. Thomson, and J. Mackenzie Robertson, Pergamon Press, 1971. This photo shows the same table from the front left, with a center-feed paper-tape tray (identical to that at the bottom front of the 2314 auxiliary reader) mounted on the outside of the left leg of the table, about halfway to the floor, feeding a reel of tape into the paper-tape reader on the side of a Friden 2340. Two take-up reels (presumably motorized) and a tape-feed reel for the punch are also mounted on the left table leg. One of the Flexowriters at the Computer History Museum, a Model 2301, includes the table we are missing. Their photos clearly show the motorized take-up reels for the paper-tape reader and punch on the left side of the table, as well as mounting holes below the reels where the center-feed tape reel holder and the tape supply reel for the punch can be mounted. 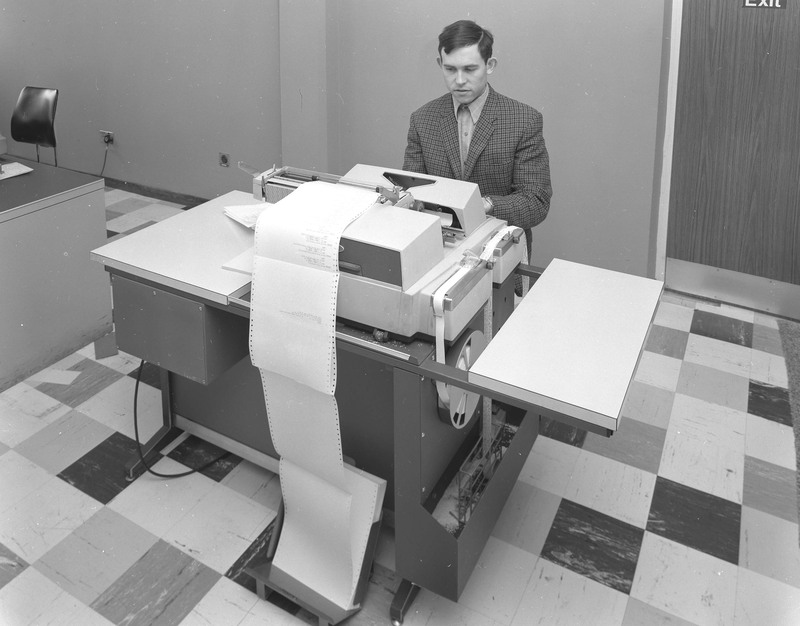 A similar table, although with different legs, appears in this photo from the Rutherford Laboratories Photographic collection, taken on June 3, 1969 showing John Bailey, Oxford and New Zealand working at a Friden Flexowriter.